The final HIPAA Security Rule §164.316 specifies that all covered entities must develop security policies to meet the new regulations. The HIPAA Academy™ bizSHIELDtm security methodology identifies seven critical steps that an organization should take to establish a comprehensive framework for protecting sensitive electronic Protected Health Information. 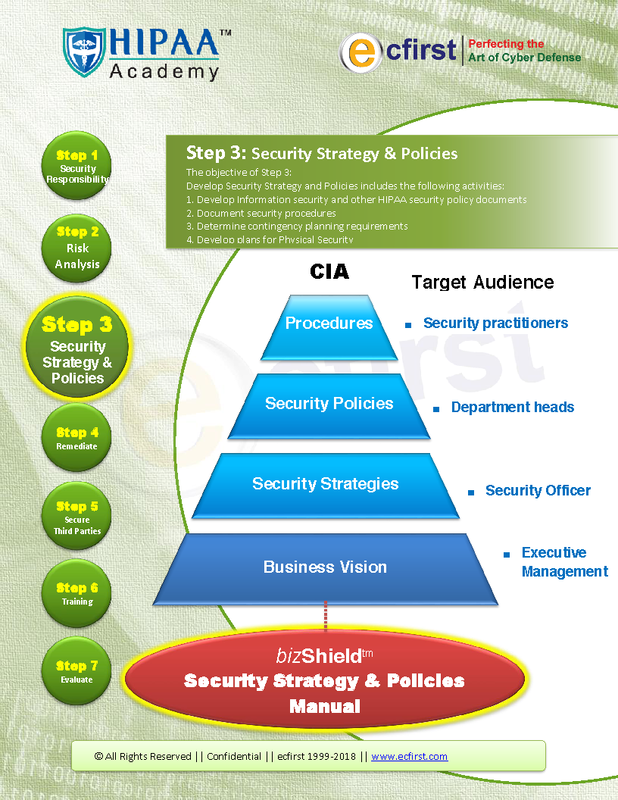 The bizSHIELDtm security methodology includes sixty one specific security policies that have been customized to meet every requirement of the HIPAA Security Rule standards and associated implementation specifications. These vital HIPAA security policies are now available exclusively through the HIPAA Academy™. Purchasing the templates for these policies from the HIPAA Academy™ can save your organization thousands of dollars by avoiding customized development fees plus you gain the assurance that the policies were developed by the recognized leader in HIPAA compliance. The bizSHIELDtm security methodology identifies seven critical steps for an organization to establish a comprehensive framework for defending sensitive business information such as electronic Protected Health Information (EPHI) and vital assets. It is a road-map to safeguard not just your digital assets but the organization’s information infrastructure as a whole. The bizSHIELDtm security methodology includes these HIPAA vital security policies that are now available exclusively through the HIPAA Academy™. The security policies have been customized to meet the specific requirements of the HIPAA Security Rule. 61 specific security policies are included in the package and address the HIPAA Security Rule Standards and associated implementation specifications. Return of Investment on HIPAA SecurPurchase HIPAA Security Policy Template Today! More than 500 licenses sold for HIPAA Security Policy Templates. Save over $8000 and jump Start your HIPAA Security Compliance by buying the HIPAA Security policy templates today. The policies are available at the Online Store. The policies are available as hipaaacademy Word template. You can add and delete as per your requirement. Purchase of the policy templates grants the organization a one entity license. Please contact John Schelewitz at +1.480.633.3225 or John.Schelewitz@ecfirst.com. to ask for FREE customization of HIPAA Security policy template so that it looks similar to your current policies.